The Law Students’ Society and Peer Mentor Program would like to congratulate you again on getting into Law! 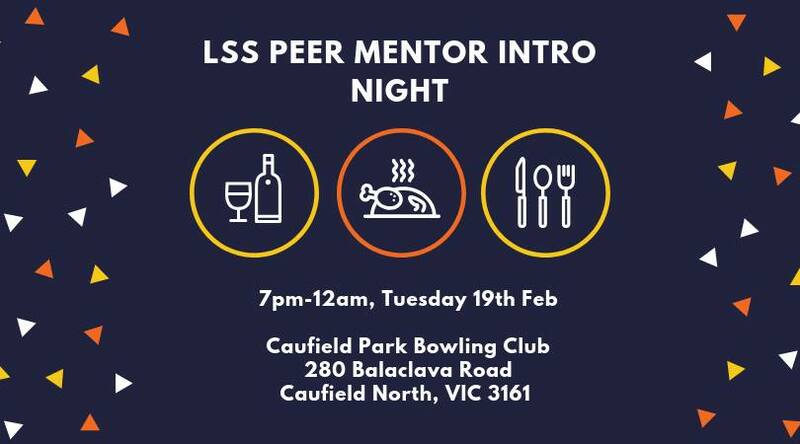 To help celebrate, the Peer Mentor Program (PMP) is once again throwing its Intro Night event – our biggest and most popular event of the year! Intro Night will be the first time that you will be meeting your Mentors, as well as the rest of your PMP group (and then your entire cohort!). Your Mentors will organise somewhere local to meet for dinner, before escorting you to the venue. Don’t worry if you can’t make dinner – your group will meet you at the Intro Night venue, with your Mentor providing you with a map and public transport details on how to get there! From 7PM onwards, you’ll have a chance to meet with the rest of your cohort, before chowing down on some pizza and enjoying some of the freshest beats we could find. There will be a bar tab, but please note: you MUST have valid ID to be able to drink. Non-alcoholic beverages will also be provided. This is an opportune time to meet everyone before semester goes back, put faces to the names of your Mentors, who will be helping you out on O-Day and throughout semester, and meet some of your family if you are going on camp! Be sure not to miss out by signing up if you haven’t already, and keep an eye out on your phones and emails for information from your Mentors! If you have any questions feel free message Sof Hay on Facebook or at peermentor@lss.com.